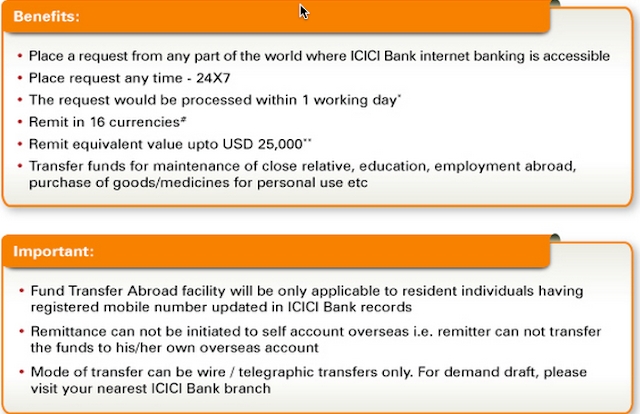 ICICI Bank takes pride in presenting you with Fund Transfer Abroad, a unique online service offered exclusively by ICICI Bank, to its ‘resident individual’ customers. Fund Transfer Abroad provides you the convenience of transferring funds, to your dear ones abroad, from the comfort of your home, at the click of a button. Just login to your ICICI Bank Internet Banking account and navigate to 'Fund Transfer Abroad' option and experience the convenient way of transferring funds abroad online. This facility will be of a great use if you have your children studying abroad and you have to transfer funds immediately in an urgency.